Every day, I am presented with the argument that a home can not be sealed tight because it must breathe. A long time ago, a friend and colleague of mine answered this comment by asking,“Have you ever seen a house with lungs?” Of course, the answer to this is no, but many people still believe that their house must get fresh air to breathe. What you must remember is that it is not the house that needs fresh air, but the occupants of the home. Also, you have to realize that everything we put in a house doesn’t need to be there, so we need to get it out. You may ask, “Isn’t this basically the same thing as the house breathing?” The answer to this is yes and no. Currently, many builders believe that fresh air needs to enter the home, but don't really care how or where. This can be a real energy buster for you if your home gets too leaky! What you want to do is control how much and where the fresh air enters - and let’s not forget about getting rid of the stale air. This is ventilation that operates on natural forces and is most commonly seen in crawlspaces and attics; however, you may see it on exterior of walls as well. This is used to lower temperatures and humidity levels in these areas. This is used to remove contaminants/stale air from a central location. An example of this is bathroom exhaust. Spot ventilation is very important to remove unwanted moisture in bathrooms and kitchens, but it can produce a negative pressure on the home. Just make sure you don’t go overboard on the size of the fan. This is simply the ventilation of the entire living space using fans. It may be broken down into sub categories or considered supply only or dilution ventilation, depending on the source. Dilution ventilation is achieved by only pumping in air to dilute stale air, and it can create a positive pressure on the home. The exhausting of air is not controlled. It can be achieved via a standalone unit or through the HVAC. Exhaust can be sub category of general ventilation, and it is achieved through exhausting of air only. This may seem like spot ventilation, but it is for the whole house and not just a certain location. It can be achieved through an exhaust fan in a central location, the HVAC unit, or through a bathroom fan that is designated to permanently stay on. This can cause a negative pressure on the home, because the intake of air is not controlled. A negative pressure can cause back drafting. This is also called supply and exhaust ventilation. The air taken in will typically equal the air exhausted. This is often achieved with piece of equipment, such as an ERV or HRV. It keeps a balanced pressure in the home, and both sides of the air exchange are controlled and possibly conditioned to help lower heating and cooling loads. There are several systems and variations on the ventilation types mentioned above. If you are building a home or just working to better your current one, talk to your contractor or someone knowledgeable about ventilation to work out a system that best fits your home, needs, and budget. Since we are taking the time to talk about ventilation this week, I thought I would just mention Energy Star appliances. Many people will probably say that they already know about this, yet wouldn't understand its connection with ventilation. Many people don't realize that there are appliances and fixtures approved by Energy Star other than the typical dishwasher and refrigerators! In respect to the topic on ventilation, there are Energy Star ventilation fans. When looking at a system that may be using one of these fans to provide ventilation, it is a good idea to have one that will save you energy. So next time you’re looking for a new appliance or fixture, check to see if there is one that is Energy Star approved, because you just may be surprised by what you find! Infrared Cameras - Can You Really See Through Walls? Many people have heard of an infrared camera and the wonderful, amazing things that it can do, but have you taken the time to really find out the truth behind the use of one? You may have heard people claim that they can see what is in your walls or if you have mold hidden in your home; while there is some truth to this, these cameras have their limitations and can’t do all that is claimed. At the same time, they can be an extremely powerful tool, and be used in applications that you would have never have imagined! To start off explaining an infrared camera, you must first understand a little about infrared (IR). William Herschel first discovered IR back in 1800. He used a prism to refract light onto a table. While he was measuring the temperatures of the various colors, he realized that the temperature on a thermometer sitting outside of the red light was higher than that of one inside the light. Upon further study, he concluded that there was energy above the red spectrum, therefore discovering infrared. Over 200 years later, we have now taken this knowledge and created cameras that can be used by individuals to see this energy. Put simply, IR is the energy emitted by objects based on their temperature. The higher your temperature, the more energy you emit. Everything in the world emits this energy; however, some things emit better than others - and there are also objects in the world that act as reflectors. This is where the limitations of the camera can come into play. First, the cameras are not able to "see through" objects. However, it does show what is in your walls by way of heat on the surface of the wall. For example, the studs heat up or cool down differently than the insulation, which allows us them to show up on camera. If the insulation and the studs are the same temperature, then they can't be seen. Likewise, the camera will now show mold in the wall; however, the camera may be able to show the water that has caused the mold, because the water heats up or cools down differently than the other objects around it. Also, the camera can't see through objects such as windows, or tell the true temperature of shiny metals or other reflective objects. This is because they have a very low emittance and they would rather reflect your energy than emit theirs. 1. Whether or not there is insulation in the walls. If enough of a temperature difference between the interior and exterior can be created, it can be seen (200F or greater is optimum.) The insulation, studs, and voids will show up as different colors or shades, and a thermographer can draw conclusions based on this. 2. Whether or not your have air leaks. When air movement is forced around the home, with as little as a 50F difference the camera can begin to show the temperature differences caused by this air. This can help with finding air leaks around the home. 3. Whether or not you have an effective air barrier. While you may not know what an air barrier is, having one is important for efficiency! An air barrier stops air movement through insulation, which increases its efficiency. To get a better idea of its benefit, a leak in the air barrier is kind of a leak around your windows, but it is in the wall, and the air may never enter the living space. 4. Whether or not you have water leaks. Water heats up and cools down at a different rate that most items in the home. Because of this, the camera can detect the temperature differences between the water and the wall or floor. These are just a few of the items that the thermal camera can be used for around the home. Depending on the applications, the camera may be able to be used to "see" - or really detect - a variety of items. The cameras are being used in everything from building to electrical to medical. There are a variety of uses for this type of camera! If there is something in your home that you can’t see or wonder about, ask a thermographer - because we might just be able to find it for you. Last week, I touched on replacement of windows and how the payback is so long. This week, I will touch on a simple way to help save energy around your windows. Blinds, shades, and drapes can all help conserve energy. By closing your blinds in the summer, you can help reduce the amount of energy gained through solar radiation; by closing your drapes in the winter, you can help retain the heat in your home. Your window dressings were not made just to look good - they do serve a function, so use them! Also, the bug screen is not just for bugs. By using it you can also reduce the solar gain through the windows. Ever since I started my career in the construction industry, I have always seemed to run into problems with HVAC systems. This shouldn’t be that surprising, since the HVAC system is the primary system responsible for the living conditions in your home and can have the most impact on how a building functions. I have seen systems that are contaminated with fungal growth, systems that you would think had been installed to provide irrigation to the crawlspace, systems that my 8 -year-old niece and nephew could have installed, and systems that are a piece of art. However, out of all of these, the latter is the rarest of them all. were not cooling or heating the home equally. The excuse for this was that two systems should have been installed, when the contractor installed only one - however, that one unit was not properly installed (twice), and ended up causing damage to the ductwork. These are only three of the multitude of cases where I have seen of improperly sized, installed, or designed units. Why is this? The only explanation I can come up with is that homeowners - and unfortunately, most HVAC technicians - do not understand the impact the system can have on the home, and that it is not as simple as a fan moving air through some round tubes. There is a standard of practice set forth in both the building code and by industry organizations that state how a system should be designed. This process takes into account how each component of the system works with the other, and combines them to provide efficient delivery of your conditioned air. This whole process starts with what is called a load calculation, or Manual J calculation. This takes into account the construction of your home and how heat is transferred between the exterior walls, ceiling, floor and the exterior environment. The next step covers the system selection or Manual S. This outlines the proper method to select a system to accommodate for the required load calculations. Next comes Manual D, which is another critical step as this is the duct design. Each system must have the ducts designed for the unit to be installed. Finally is Manual T, which is the register and grill sizing. Even grill sizes can impact your comfort levels! 1. Make sure Manual J, S, T, and D calculations were performed for your system. Of all of these, Manual J and D are the most critical. Whether you are having your home system replaced (ducts and system) or just the unit, these calculations are critical. There is no such thing as rules of thumb or matching the system with what you previously had. Each home is unique, and the system you had before may have been improperly sized. 2. Your ducts impact your system’s efficiency. While most people will try to just install a new unit and keep using the old duct work, this can actually cost you money. If ducts are improperly sized for the system, they can cause the system to operate inefficiently. Why pay for the more efficient system if it is going to operate at a lower efficiency than the one you just replaced? 3. Manual J has safety factors already figured in. There are some companies that will perform Manual J calculations, but they will not use the weather data provided in the back. Instead, they will design the system for hotter temperatures. You don't design systems for newsworthy days! By raising the design temperature, you oversize the system. When you do this, you size the system for 1% of time it is in operation - and oversizing for 99% of the time. 4. The lowest or highest price may not be the best. Do NOT Install Replacement Windows! The tip this week is more of a what not to do instead of a what to do. Every day, I see a commercial advertising replacement windows and how much money they can save you; and every day, I know someone has invested a lot of money into their home that they will not get paid back. Many people are advertising 50% savings with the replacement of new windows. This is completely true. You may save 50% on the amount of energy the windows cost you, but this translates to only about 10% to 15% of your total bill. With this limited savings as compared to the cost of the windows, you end up with a very long payback period. If 10 windows cost you between $6000 and $7000 and you save a gratuitous 20% on a utility bill of $200, your payback will be between 12 and 15 years. This is almost a best-case scenario. In most cases, the paybacks for replacement windows are going to be between 20 and 30 years, because the savings will not be that great for such a small investment. Most homeowners are not going to be in the home for 15 years, and if they are, there are several other items that can be done to the home that have a quicker payback. I will only recommend replacement windows in extreme cases. In the majority of the homes I see, I would more likely recommend installation of storm windows (for single panes), or repair of the windows currently in place, typically because those are the best scenarios when windows are involved. So next time you have someone suggest you replace your windows or you see the commercials, remember that those windows will save you money, you are better off investing in other, similarly effective improvements that have a much shorter payback period. As a homeowner, you may have heard the term "energy audit" by now, but you may not know what one is or how it works. Many people think an audit is something done by the IRS or given freely by their utility companies. Some even think it's a gimmick made up by “tree loving” individuals. The truth is that an energy audit can be a very useful tool to aid you in saving energy - and ultimately, money! The complex definition of an energy audit is “an evaluation of the energy flow through a building with the objective of understanding the energy dynamics of the system.” To break this down into simple, understandable terms, an energy audit is just the objective evaluation of a home or building’s energy use. There are various methods of performing the audit, and even more individuals who are trying to break into the industry. Because of this, you as a homeowner must take time to understand the steps in an audit, learn what you should expect from it, and obtain the knowledge to empower yourself to choose the most qualified professional in your price range. In doing all this, you may even gain enough knowledge to perform a basic audit of the home yourself. The first bit on knowledge you should obtain is that an energy audit should consist of six primary categories. These categories may have several sub-categories depending on how extensive the audit is but an audit should always have these six main areas of concentration. As mentioned before, each area may have sub-categories (i.e., "building envelope" will usually include windows and doors, and "appliances" will usually include water usage), but the sub categories will depend on the auditor and the building. The most difficult category for a professional auditor to observe is the occupant’s habits, and this portion of the audit will consist of generalized recommendations. This category, however, is one that you will be able to best analyze yourself, but may not want to admit. As stated before, a homeowner or building owner can perform an audit themselves. However, an energy audit for a building is more difficult, and it is typically best to hire someone to conduct an audit of a business. If you would like to perform an audit of your home, you first need to gain a little knowledge on the subject. This can be gained through reading books on the subject or visiting Websites. Cut Your Energy Bills Now: 150 Smart Ways to Save Money and Make Your Home More Comfortable & Green by Bruce Harley is a good book to get some how-to knowledge and learn about areas for consideration with an audit. You will not only learn about the areas of the home you need to check out, but also how to perform some of the repairs if you are so inclined to do so. The N.C. Ag Extension Agency’s E-Conservation program is also great for online and local education events. They will hold information sessions and training events periodically. Check with your local extension agent for more information if you live in North Carolina. The DOE Energy Savers Website is also a good resource. Once you get a little background information, you may want to use a checklist to help with the audit, or you may choose to just look around your house. You can make a small but noticeable impact on your energy usage by performing an audit yourself, but to get an even bigger impact, you may look to a professional auditor. In choosing an auditor you must be careful, because there can be wide range in the quality of the audit. Some individuals provide little more than what you could do in performing an audit yourself. Others provide professional insight into the home and how it functions. Above that, they provide cost-saving tips that may be able to save you the cost of the audit in as little as one year. As mentioned, a professional audit will vary, but all audits should consist of a blower door test, a visual inspection that covers the 6 main areas, and the results should be generated in a report that makes recommendations based on your return-on-investment or savings-to-investment ratio. 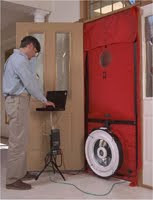 For those that may not know, a blower door is a piece of equipment that helps an auditor determine the tightness of a home and where leaks are occurring. More advanced audits may include thermal imaging of the home using a thermal imaging camera and duct testing. While thermal imaging is a great benefit and it is becoming more commonplace as prices of equipment decrease, this one particular item does not necessarily make an audit better. Duct testing is another item that is not necessary, and often times as far as you will be concerned, the information needed to make a decision regarding the tightness of the ductwork can be determined using certain techniques during the blower door test. When selecting an auditor, you should remember that one week-long class does not make a good energy auditor! There are several places to start when looking for an energy auditor, and one that many people recommend is the EPA Energy Star program. While being a HERS rater (Energy Star rater) is a good indication of an individual understanding the basics of a building environment, it also does not necessarily mean the individual is qualified to perform an energy audit. The process of certifying a home for Energy Star and performing an energy audit are two very different things, and sometimes you will find a HERS rater will not perform audits. So how do you find a qualified auditor? 1. Search the Web for auditors in your area, ask neighbors or relatives who may have had an audit, and check trusted resources for certified individuals.As mentioned, HERS certification is a good place to start, but it doesn't end with that! Referrals are a great source of information because you can see the outcome of the audit before you ever have one. 2. Talk with the person who will perform your audit and get some insight into their process.Ask about their qualifications, certifications, audit experience, and general knowledge of the subject. As mentioned, a professional audit should always consist of a blower door, a visual inspection, and the results should be generated in a report that makes recommendations based on your return-on-investment or savings-to-investment ratio. 3. Ask to see a sample report. You can learn a lot about an auditor from the information a sample report contains. Does this report explain the “whys” of the recommendations? Does the report give an overview of the location of the findings? Does the report give an easy-to-read summary of the recommendations in a usable, cost-conscious and informative format? 4. If the auditor is to use a thermal camera, ask them if they are a Certified Level One Thermographer.This is a good indication if they have a basic knowledge of how the camera works. A thermal camera is a complex piece of equipment, and the information gathered from one can be very useful; however, the individual should have some training on how to use the equipment. 5. Finally, do they also perform repairs?While this is not always problematic, it can sometimes lead to questions regarding an auditor’s objectivity. Ask the individual how they plan to stay objective and ask for references from previous audits. Overall, an energy audit is a very useful tool in beginning the process of becoming more energy efficient and sustainable. You may choose to perform an audit yourself, or you can hire a professional. If you should hire a professional, take the time to make sure that they understand what they are doing, they have the correct equipment, and they are going to provide you with information that you can use to save money. Finally, take time to educate yourself on the subject, because a smarter homeowner is always a happier one! With all the talk about saving energy, I think it is best to introduce two items that I believe a homeowner will find to be very beneficial in saving energy. Both of the items are energy monitors. Neither one of these units will save you energy themselves, but they will make you more aware of your energy use. The first unit is from Blue Line Innovations. I have personal experience with this, and have watched its use change the habits of an individual who didn’t always believe the items I recommended, such as washing clothes with cold water. This unit is easy to install. You simply place the sensor over the power meter and sync up the base unit. After a few minutes of entering the power cost information, the unit will begin to track your energy usage, displaying current usage and total usage. You must reset this every month to keep a monthly tally, and you must replace the batteries in both units every so often - though this can lead to some sync issues, overall this unit will really make you aware of the usage in your home. The second unit is The Energy Detective, or TED for short. This monitor hooks up to your electrical panel and can track usage from one circuit or the entire house. A homeowner may be slightly intimidated by the way the unit hooks up and may want an electrician to perform the work. I don’t have personal experience with this one, as I am awaiting the release of the 5000 series to make up my mind as to which unit to try, but I can say I have heard great things about it, and the features look really great. Like the Blue Line Innovations model, the unit tracks both real time and monthly usage, but you get additional features if you use your computer. The system can graph usage, showing peaks and valleys to allow a homeowner to see when certain items may be coming on or going off. This information may be more beneficial to an energy auditor, but alas, it is more information to improve your energy habits! Both units are great additions to any home, as the hardest thing to get a homeowner to correct is their habits. These units make the homeowner aware of their energy usage and can help modify habits. With both units selling for around $120, they are both comparable in price and features, but if a homeowner wants to spring for the additional $45, they can get the footprints software for their 1001 series TED and up the information they get. The TED 5000 series will start at $200, but it appears to be coming with a lot of additional features. Regardless of which unit you may choose, you will find them to be a cost saving purchase as long as you pay attention to them!